Handbag Holder - hang the handbag storage hanger in your cupboard or over the door for convenient handbag and purse storage; perfect closet organiser idea! High Quality Storage Holder - made of solid workmanship for best storage for purses; crystal clear vinyl pockets provide easy view of contents. Purse Organiser - is an ideal purse storage solution for conserving shelf space; best way to organize handbags by placing them in the hanging handbag organiser; 8 pockets hold multiple bags at once; handbag organiser keep bags dust and damage free. 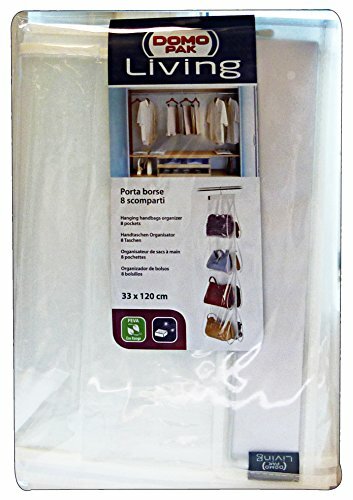 Hanging Organiser Features - hanger style hanging purse provides flexibility to hang from rod in closet, or hook on back of door; handbag file hook has ability to turn for easy access of your accessories; horizontal insert "loops" on pocketbook storage makes it easy to use.